You can browse, but we're unable to process purchases at the moment. Try again in a bit. 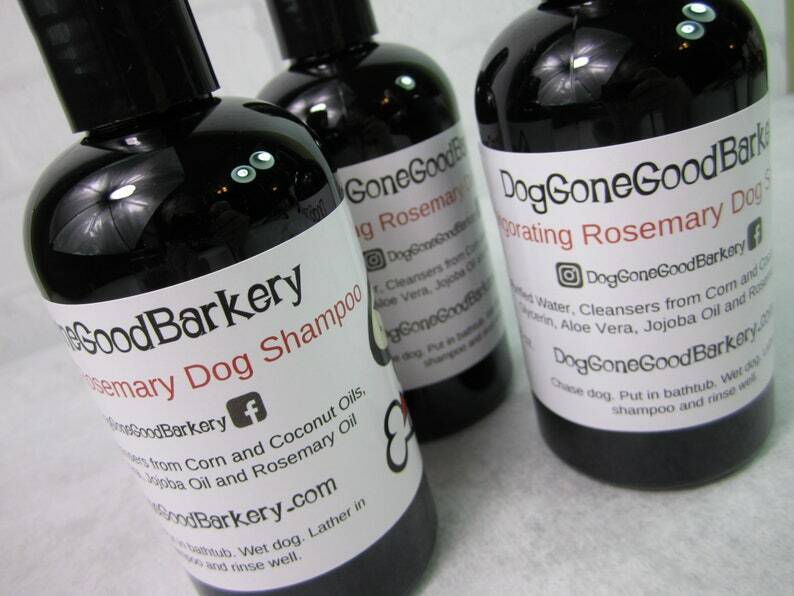 Your furry friend will love the Dog Gone Good Barkery Invigorating Rosemary Dog Shampoo! It is truly a wonderful invigorating shampoo for your dog. It comes in 2 sizes, 8 and 16 ounce bottles. Rosemary is a woody perennial herb used for centuries as both a culinary herb and a medicinal plant. Rosemary has antiseptic properties, too. Rosemary works as a natural flea treatment. *Contains NO sulfates, parabens, detergents, dyes, alcohol, synthetic colors, fragrances. *Formulated with a blend of coconut, corn oils and aloe vera leaving your dog with healthy skin and a silky, shiny coat. *Rosemary helps rid your dog of pesky fleas naturally through the use of plant-derived ingredients. *Keeps your dog smelling clean and fresh and looking beautiful for days. You will have one happy dog! *Dog Gone Good Barkery Shampoos are cruelty free and made in the USA. Chase your dog and put him in the tub. Whew! The hard part is done! Wet your furry friend with warm water, shake the bottle and lather in the shampoo. Make sure to keep out of his eyes. Rinse well. After he shakes all the water off all over your floor, brush and give him some lovin' and a treat from Dog Gone Good Barkery! **Please DO NOT use on Cats and always recycle your bottle!